Did you hear me on the radio this past weekend? 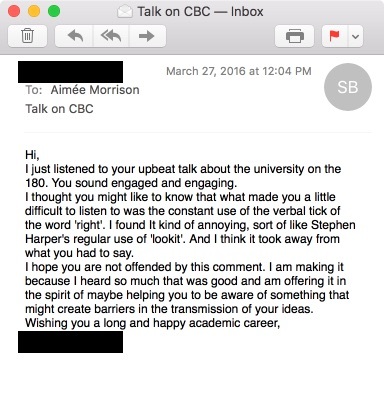 My blog post about the Srigley Manoeuvre sort of took off, which is how I wound up taping with CBC Radio 1’s The 180 the very day I wrote it. I’m only a little bit offended. Why did we wear these clothes? I used to win these thing a lot. So did my esteemed runner up, on my immediate left, who you might recognize as former Halifax NDP MP Megan Leslie. She turned out to be a pretty good public speaker too, who also gets friendly advice on self-presentation from random people in her email. 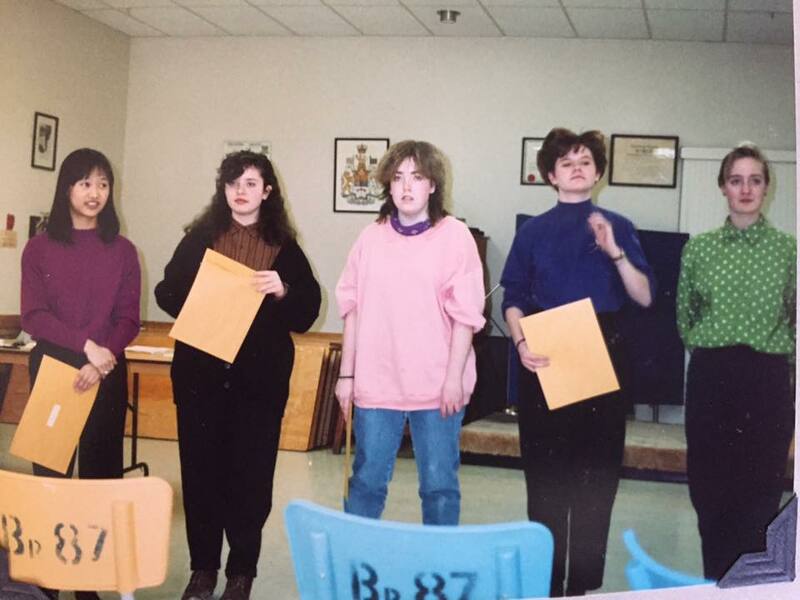 This despite the fact that we’ve literally been honing our skills at this since at least 1990, at the Kirkland Lake branch (87!) of the Royal Canadian Legion, as you can clearly see here! sit up tall with free belly movement so I can take deep breaths and my vocal cords aren’t pinched and my voice has room to resonate in my body. 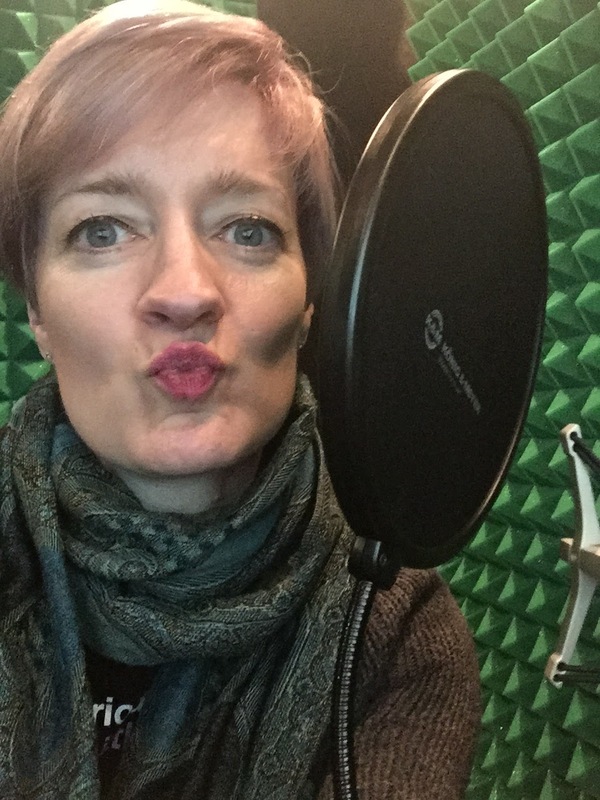 keep my face pretty damn close to the microphone: it sounds like I’m talking about a café table distance apart from a listener, so I can speak at a conversational volume. drop the pitch of my voice to sound warmer, and to give me more room to shift my pitch up without squeaking; this always entails vocal fry. occasionally and deliberately smile while talking, particularly when saying hello to the host and then again when saying goodbye. selectively uptalk because I am trying to pull people along with me, and uptalk asks them to pay attention. It also softens the lecture quality of some of my paragraphs of speech. insert, yes, little markers like “right” and “you know” because I am trying to sound like I am interested in securing the assent of the listener. My daughter and I were in the car when this particular segment aired and she said “Moooooommmmm, your voice sounds so preetttttttyyyy.” Because I don’t sound like that in real life; I’m more nasal, flat, and sarcastic, generally. Radio voice is performance. Uptalk, vocal fry, AND duckface! A bridge too far! Less on purpose are the “um” and “like” noises that creep in, and I know exactly why they happen: it’s because I’m conscious I’m being taped and when you stop talking you seem like you are freezing up so the little micro-um buys me time to figure out how to finish what I’m saying. The “um” feels like massive and precious thought-completing time when I’m saying it, and it just slides right by when you are listening. Radio hosts never say “um” in this way because they are actually mostly reading from scripts; their skill is to sound like they’re not, but I’ve sat in a booth with Anna Maria Tremonti for The Current and she is reading from a (heavily marked up and personalized) script. Still. Me, I say “right” too much. My voice is annoying and I should try to fix it so that people will listen to me. I am not the first woman to hear that. Listen to NPR talk about it! Listen to This American Life talk about it! Read all these articles about what is wrong with how women talk and why they should stop … basically … talking at all. At least until they rid their speech and writing of all its female problems using an app that automates the tone policing! I think we’re still just not ready to accept women as experts and as authorities and as entitled to occupy some portion of the national attention on some version of the national stage. Remember the moral panic about uptalk? I’m not hearing anything about my pronounced uptalk. Because I do it melded into the rest of my speech and so many people now do it that it just sounds natural now. Remember the plague of “like” and “you know” and “well”? Well, like, I guess that’s not a thing anymore, you know? I guess “Right?” is most wrong because it’s a youth pattern of speech, and a regional pattern of speech, and maybe not many Professors of Expertise in the field of Seriousness use it in their interviews. Well. Guess what? I went into that interview in particular with a goal to speak smart but informal. To girl it up (uptalk) and be more current (“right?” and vocal fry) because I wanted to sound like the Anti-Srigley. Because Srigley, recall, looks like a clip-art, central casting professor, and he writes in the voice of a portentous old fart. And I want no part of that. I’m no clip-art, central casting professor, and I’m going to write like someone who has a PhD and who watches TV and interacts with a wide variety of people and reads blogs and generally participates in the culture of my time and my place. I want to change that stereotype of professor: professors are ladies, and humans, and fun. Aside from the occasional “helpful advice” on how to be less annoying, I think it’s working. Thanks for sharing that 'feedback' publicly. Having heard your everyday voice, it is clear that you are performing, as you noted. I can't help but contrast your experience with mine–a white het male with a low- to mid-scale, i.e.- 'typical male', voice. I've also been speaking publicly for decades and have worked to hone my craft as well, which includes watching and listening to clips of myself speaking to pick up on tics and movement habits; it's a painfully embarrassing but worthwhile practice. Alas, and not surprisingly, other than being told I'm speaking too fast or too low (which is something I do when making ironic asides inside a talk), no one has ever criticized nor commented upon my speaking style other than to give compliments. Besides, the remarks about speed and pitch seem fair, since all they're saying is that they're trying to understand me, not that I'm doing something wrong because I'm a man or whatever. “I'm no clip-art, central casting professor.” Great line, great post! Curious: do you know or have a sense of the gender of the person who wrote the email? I kinda think it would make a difference to me, if I got an email like that. Woman. And I sincerely believe she was trying to help. Why Can't We Be Our Whole Selves as Academics?